The human brain is one of the marvels of God’s creation which has not yet been fully unraveled by science. The human brain has billions of brain cells which work in tandem to control our body and do various functions. Not long ago it was estimated that the average person uses only 10% of their brain power. Then a few years back that estimate was lowered to 5%. But modern neuroscientists now feel that the average person probably uses 1% or less of their actual mind potential. One may be shocked to learn that if our brain cells and all their neural connections were laid out end to end, the “line up” would measure at least 800,000 kilometers. This is more than the distance to the moon and back! (A round trip to moon from earth is 768,806 kilometers). How much electricity does our brain produce? Yes, our brain’s nerve cells (neurons) really do produce measurable electricity. The measurable electrical potential of our brain is actually enough to light up a 25 watt bulb. Cultivate ambidexterity: Use your non dominant hand to brush your teeth, comb your hair or use the mouse. Write with both hands simultaneously. Switch hands for knife and fork. Remember Arjun? He could use both hands equally well. When my daughter Neha met a severe road accident last Dec she had multiple fractures and her right hand was operated upon and in a plaster for 3 months. She started using her left hand and was soon doing everything almost equally well. Block one or more senses: Eat blindfold, wear earplugs, shower with your eyes closed, listen to TV news with eyes closed – you will feel a new range of sensations. Learn a language: Learning a new language has been proved to halt the age related decline in brain function. It is one of the best brain exercises. 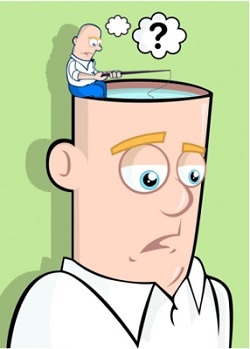 Mindfulness exercises: Concentration and clear thinking are more or less automatic once you remove distractions. Learn to stop and watch your busy mind. As you notice things that are subtly bothering you, deal with them. This might mean making a phone call you need to make and were putting off or cleaning your wardrobe or making a list of things to be done or running an errand for your mother. With practice this becomes easier, and your thinking becomes more powerful. Listen to music: In a study in the University of California researchers found that children who studied piano and sang daily in chorus, were much better at solving problems and when tested scored 80% higher in spatial intelligence than the non musical group. Listening to soothing music relaxes the brain and singing activates the brain. Solve puzzles: Crosswords, lateral thinking puzzles, soduku, vocabulary exercises and even good riddles are a great way to exercise your brain. You can work on them while waiting for a train or bus or plane, on a journey, at a doctor’s appointment or anywhere. Temperature: Many people have noticed that they think better at certain temperatures. In general it seems that being slightly cool but not uncomfortable is most conducive to good thinking. Try experimenting on yourself to see what temperature works best for you. Imaginary friends: Talking to and getting advice from characters in your mind can be a great way to access the information in your subconscious mind. Imagine a conversation with a person who has a lot of knowledge in the area you want advice on. Doodle: A doodle is a type of sketch, an unfocussed drawing made while a person’s attention is otherwise occupied. Doodles are simple drawings that can leave concrete representational meaning or may just be abstract shapes. Many artistic masterpieces originated as doodles by the artist. Doodling helps a person’s memory significantly. Sleep better: As long as you get a certain amount of sleep (8 hours a day is ideal) the quality seems to be more important than the quantity. Also a short afternoon nap seems to work well to recharge the brain for some people. Dont forego your sleep during exams, your brain wont function properly if you are sleep deprived. Socialise: Mixing with lot of people in society helps your brain to function well as you hone your interpersonal skills, be more tolerant, accept others views and meet new people. Sitting at home makes you a loner and an introvert. Cultivate your hobbies: As the saying goes “all work and no play makes Jack a dull boy”. Cultivate your hobbies and encourage your mind to be creative. It activates your brain and leaves you with a sense of satisfaction.